Oil's rapid decline since August of last year has been dramatic. To listen to some commentators you would also think it is unprecedented and irreversible. Those claiming that oil will continue to fall from here and remain low for evermore, however, are flying in the face of both history and common sense. The question we should be asking ourselves is not if oil prices will recover, but when they will. From June of 2014 until now, the price of a barrel of West Texas Intermediate (WTI) crude oil has fallen approximately 57 percent. As the above chart shows, there have been drops of a similar percentage five times in the last 30 years. The rate of recovery has been different each time, but recovery has come. In addition, since 1999 the chart shows a consistent pattern of higher lows. In other words, oil is a volatile market, but prices are in a long term upward trend. Charts can only tell us so much, however. 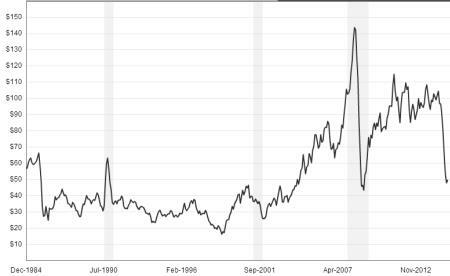 Even a long term trend can be broken if fundamental conditions change, and that, say those predicting that oil will never recover, is what has happened. There is no doubt that supply has increased. Hydraulic fracturing, or "fracking" technology has unlocked reserves of oil and natural gas previously thought of as unrecoverable. Supply alone, however, doesn't determine price. We must also consider demand, and that has been increasing too. According to this chart, from the U.S. Energy Information Agency (EIA), demand has been increasing along with supply since 2010. Admittedly there has been a production surplus since the beginning of 2014 but that is nothing new and is forecast to be back in balance by the end of this year. The increased production, then, is in response to increasing demand; hardly a recipe for a protracted period of low prices. The supply situation makes it unlikely that the recovery will be rapid, but a gradual move up over the next few years is the only logical conclusion. The low price brigade cites another factor in making their predictions, the rise of alternative energy sources. There is no doubt that there have been significant advances in that area, particularly in wind and solar power, but, according to the EIA, renewables currently account for 11 percent of the world's energy consumption. 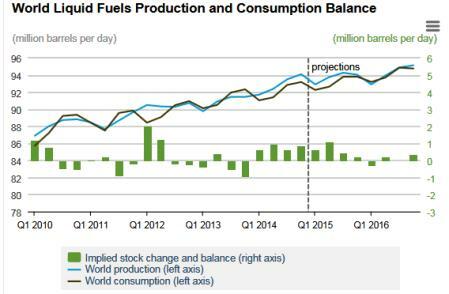 That number will undoubtedly grow in the coming years, but, whether we like it or not, oil consumption still looks set to grow over the next few years. Fracking can fill some of that demand, but the simple fact remains that oil is still used extensively, and we are using more of it every year. The price simply cannot stay low for an extended period, but while it does it will delay research and infrastructure spending on renewables, slowing the pace of their adoption. Any increase in price would be hastened by a decision from OPEC and Saudi Arabia in particular, to reduce production. Right now they say that that is not on the cards, and why would they cut back? Their attitude seems to be that the oversupply was not their doing, and as their oil is cheap to produce, they can sit back and watch those who did cause the problem, most notably the upstart American companies, suffer. OPEC has always played the long game and will undoubtedly do so again, but once the lesson has been taught the pressure to restrict supply somewhat will mount. Again it may take time, but it will probably come. History tells us that the price of oil will bounce back, but so does basic logic. Oil is a finite resource that we are using at an increasing rate, and as long as that situation remains, the laws of supply and demand mean that the price must recover. That is a good thing. As long as oil remains cheap there is little incentive to invest in the alternatives that we will inevitably need someday, nor to reduce our consumption of what is essentially a dirty fuel source. So, enjoy low fuel prices while you can, but don't expect them to last forever. Martin Tillier is a writer for Oilprice.com where this essay orginally appeared.